A list of exchange rates for various base currencies given by a money changer in Thailand, with the Thailand Baht as the counter (or quote) currency. Codes for precious metals Gold (XAU), Silver (XAG), Palladium (XPD), and Platinum (XPT) are formed by prefixing the element's chemical symbol with the letter "X". 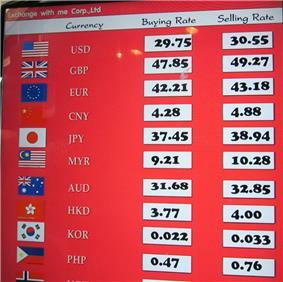 These "currency units" are denominated as one troy ounce of the specified metal as opposed to "USD 1" or "EUR 1". The inclusion of EU (denoting the European Union) in the ISO 3166-1 reserved codes list, allows the euro to be coded as EUR rather than assigned a code beginning with X even though it is a supranational currency. The ISO 4217 standard includes a crude mechanism for expressing the relationship between a major currency unit and its corresponding minor currency unit. This mechanism is called the currency "exponent" and assumes a base of 10. For example, USD (the United States Dollar) is equal to 100 of its minor currency unit the "Cent". So the USD has exponent 2 (10 to the power 2 is 100 which is the number of Cents in a Dollar). The code JPY is given the exponent 0, because its minor unit, the Sen, although nominally valued at 100th of a Yen is of such negligible value that it is no longer used. Usually, as with the USD, the minor currency unit has a value that is 100th of the major unit, but in some cases (including most varieties of the dinar) 1000th is used, and sometimes ratios apply which are not integer powers of 10. Mauritania does not use a decimal division of units, setting 1 ouguiya (UM) = 5 khoums, and Madagascar has 1 ariary = 5 iraimbilanja. Some currencies do not have any minor currency unit at all and these are given an exponent of 0, as with currencies whose minor units are unused due to negligible value. 9. In applications where there is a need to distinguish between different types of currencies, or where funds are required as in the banking environment, or where there is no field identifier, the third (rightmost) character of the alphabetic code is an indicator, preferably mnemonic, derived from the name of the major currency unit or fund—example: USD for general, unspecified purposes; USN for United States dollar next-day funds, and USS for funds which are immediately available for Federal Reserve transfer, withdrawal in cash or transfer in like funds (same-day funds). Since there is no need for such a distinction in international trade applications, the funds codes have not been included in the Annex to the present Recommendation. The following non-ISO codes are, however, sometimes used commercially. A number of currencies were official ISO 4217 currency codes and currency names until their replacement by the euro or other currencies. The table below shows the ISO currency codes of former currencies and their common names (which do not always match the ISO 4217 names). These codes were introduced in 1989 after a request from the reinsurance sector in 1988 was accepted. ^ a b c Number of digits after the decimal separator. ^ a b "Unidad de valor real (UVR) – Banco de la República de Colombia" [Unit of Real Value (UVR)]. ^ According to Article 4 of the 1994 Paris Protocol . The Protocol allows the Palestinian Authority to adopt additional currencies. In West Bank the Jordanian dinar is widely accepted and in Gaza Strip the Egyptian pound is often used. ^ "Amendment of ISO 4217". 7 April 2011. ^ Hammett, Mike (2001). Dictionary of International Trade Finance Terms. Canterbury: Financial World Publishing. p. 176.